Abbas Saffari was born in 1951 in Yazd, Iran and has been residing in the US since 1979. He was one of the first to recite avant garde, surrealist lyrics in Iran for the singer, Farhad. He is the author of Twilight Of Presence (Los Angeles, Tasveer, 1995), Confluence Of Hands and Apples (Los Angeles, Kaaroon, 1992), and Old Camera and Other Poems (Tehran publisher, Saales, 2002) and has been poetry editor of Iranian literary magazines in exile such as Sang (1997-2000) and Cactus (2000-2002). He has contributed poetry to the online Poets Against the War magazine. He studied Sculpture at Long Beach State University and is currently living in Long Beach, California with his wife and two daughters. 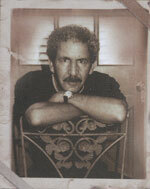 He is one of the handful of Iranian poets living outside of Iran whose work is published and read in Iran. In January 2004, Old Camera and Other Poems won Poetry Book of the Year in Iran.